There are five city stations: Flinders Street, Southern Cross/Spencer Street, Flagstaff, Melbourne Central, Parliament. The train lines that service our area are Watergarden or Sunbury & Werribee or Williamstown, disembarking at Footscray Station. 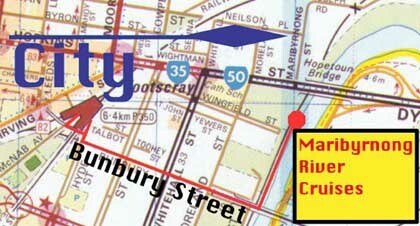 Bunbury Street is on the left hand side of the station coming from the city, you then walk along Bunbury St towards the city to the river, turn left at the river and walk along the bicycle / walking path until you arrive at our office. This is approximately a 10 to 15 minute walk from Footscray Station.